While enjoying a cup of coffee and some live jazz at Zoka tonight, I ran into a self-described Seattle old-timer. He was more than happy to tell us about Tangletown’s history, and spent a long time musing about this place that no longer exists- at least, not near Green Lake. Once upon a time, there was a place called Honey Bear across the street, and in the good old days, that was where everyone went. You’d run into people from Denmark and Sweden while getting $1 cinnamon rolls, and people talked to each other- it wasn’t unheard of for customers to just randomly ask if other customers wanted to go walk around Green Lake after their meal. According to our new friend, Honey Bear was world-famous, because it was so homey and cozy, and one visitor attempted to recreate it in his home country, but was unsuccessful. As these things often go, Honey Bear’s owners sold it, and the new owners weren’t engaged in the day-to-day management, and changed the staff and the atmosphere, leading to its eventual death. Stories like this make me miss the Seattle I never knew. It’s hard to imagine a restaurant where Seattleites actually talked to each other, and hung out together after meals, though this gentleman’s personality made me believe that perhaps once upon a time, Seattle was the kind of place where these things could happen. Honey Bear has reincarnated in Ravenna and Lake Forest Park, so perhaps I’ll discover a similar community if I manage to venture up that direction; but it does make me nostalgic for this magical place this man described, that I won’t ever be a part of. It does make me wonder if there are other places that have that kind of friendly following that I just haven’t discovered yet… and also, whether there are other places old-timer Seattleites get nostalgic for that I should know about, even if I won’t ever be able to experience them. So, those of you who have been here for a while, what am I missing? "Stories like this make me miss the Seattle I never knew. 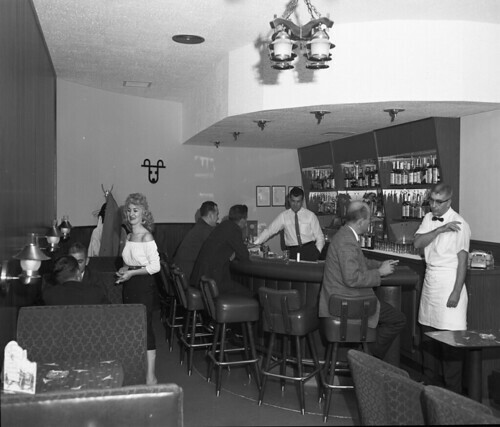 It’s hard to imagine a restaurant where Seattleites actually talked to each other, and hung out together after meals…"
so here’s a question, when was the last time YOU talked to the other restaurant patrons? when was the last time YOU asked them to go for a walk after work? it’s all well and good to miss a seattle you never knew but to pine for something that you could easily create yourself seems hypocritical. you want the benefits of a friendly community but aren’t willing to take it upon yourself to make that community happen. next time you are in a restaurant, how about striking up conversation with your fellow diners? and then how about asking them to go for a walk? lead by example. I guess I didn’t mention that I was the one that struck up the conversation with our neighbor. I usually try to, particularly at Zoka, because it’s a cozy place, and am not often successful. But tonight was very special :) Heck, I would have asked him to go for a walk if it hadn’t been dark by the time we started the conversation. Nice post, Beth. I wish I could recommend a place like you describe. If you find one, let us know. As I recall, the Tangletown Honeybear (which wasn’t Tangletown back then, but anyway) closed because the space they were in was getting demolished to make way for a condo, and they really didn’t want to move. The Ravenna Honeybear didn’t last more than a couple years. IIRC, that space they were in was a PCC before. I went out for coffee with a high school friend at Honeybear 1.0, back in the mid-90s. She told me how much she didn’t like Seattle, how people were cold and the rain was getting to her. She ended up moving back to Oklahoma. I stayed.